He came to me in October 1998. 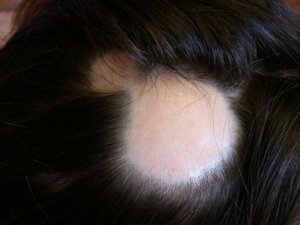 Since February 1998 he had seborrhoic eczema under his hair at the front-side of his head and locally on the scalp with some bald spots diagnosed as alopecia areata. These spots were perfectly round and situated at the backside of his head. The biggest one 5 cm in diameter. The dermatologist gave him corticosteroid crÃƒÂ¨me and some special liquid for the scabby eczema. The result was that he lost the hair at these treated spots too. The eczema extended to his abdomen and arms in spots. He went to the dermatologist for the first time in 1992 and called this doctor ‘socially disturbed’ because he made some humiliating remarks about the anxiety of the patient. He never went for another consultation. Observation: He is a rather tall nice looking man. He answers carefully and waits for my questions, he doesn’t talk freely. He has been healthy all his life, but as a child he caught the flu regularly which used to end in bronchitis, this was treated with a mucus solvent. He is the youngest of 3 children, he has a brother and a sister. I asked for his latest stress period. In 1997 he finished his studies in Political Science and did a post doctoral degree in the U.S. He had to look for a job when he came back. In February 1998 he had 2 jobs. One he didn’t like so much, so he was looking for another one and at the same time his relationship broke up. She walked away with another man. “my self confidence went down. Actually I am a rather rational person. It came unexpectedly in fact, it was painful to me”. At the age of 22. He was in a relationship and she too broke the contact suddenly and he felt very powerless at that time. “I feel often under estimated in contact with people”. I asked him about anger. “Not much. I thought about death and existential questions.” His parents are living in Germany were he grew up and lived till he came to Holland after the hospital period as a volunteer for a German reconciliation program. “I wanted to leave Germany and I wanted my work to have a real meaning. I have been studying German history a lot and asked myself ‘how could it happen’.. that people can just follow the commands… Befehl ist befehl ! !” On one side he has a sensitivity, kind of fear of being a German, on the other side “I don’t feel too German after all”. At this time he is working as a freelance translator just for the time being. His option is to join a big welfare organisation. Likes to travel all over the world. Digestion? Good, doesn’t eat meat, sometimes fish. Not thirsty. His energy is okay, so is his sleep. Doesn’t remember his dreams. Lives alone. (at the time I did not know the real core of Staphysagria or the Ranunculaceae). A Family? “Why not, has to be carefully thought over, it is a big responsibility. I am reluctant to a relationship.” No further changes. Feels fine. Had a dental treatment last month. Stayed at his parental home for Christmas holidays, had discussions with his family. ”I tried to imagine myself in their way of thinking and living“. Is busy to apply for a new job. Feels well in himself, no more feelings of displacement. As a freelancer he likes to work in the evening and at night. “There are less people ‘alive’, but the contacts are more personal. He likes to go through the city at night, nature is more present at that time and the idea that people are asleep is romantic." He feels himself more pure and more easily touched. Observation: The bald spots diminished these months by 30%, but after the second consultation he told me that it didn’t bother him anymore. I myself had the feeling that there had to be a better remedy and tried my best to find the appropriate one. Then in January 1999 I saw the similarity of the alopecia spots of a former patient (see edition April 2009) and the ideals and principles in both men. So by this time I knew that I would give him Ang. Archang. I just wanted him to tell some more about his philosophy. He feels fine. He plans about the realization of his ideals. He committed himself to a big welfare organization and stopped his freelance work. His job will be to teach etc. He feels the need to change things in society. He hates materialism. He is no member of any church because this is too much of an institution. He is brought up in a Christian environment. “As a young child I wanted to be a clergyman, now I feel Taoism is what I like, its practical philosophy”. He has a clear point of view on what is right or wrong. Now he is ready to search for the pure life and pure deep contact with people. He has no T.V. “is humbug”. Cloistre? “Seems very nice to me, to be there with people in a warm community, in contemplation and sharing ideals, ideals to life and one another." I called him in August 1999 to ask permission for this publication. He is going well, no complaints and so some months later.